Analysis: The 2010 first-round pick has spent his entire career in Philadelphia, playing out his rookie contract followed by a four-year, $26 million deal. While never quite dominant as a pass rusher, Graham offers a nice mixture of durability, consistency and versatility, with five straight seasons recording at least 39 tackles, four sacks and 15 appearances. He'll celebrate his 31st birthday in April and should be locked in as a starter at defensive end for the Eagles. Analysis: Graham's stats belie how impactful he was as a pass rusher. He only logged four sacks, but the 30-year-old ranked among league leaders with 60 quarterback hurries. Overall, Graham performed well in what was the last year of his contract, and he should have a strong market when free agency opens in March. 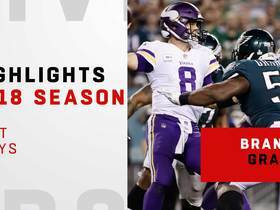 Analysis: Graham suited up for 82 percent of defensive snaps for the Eagles on Monday and was able to notch his fourth sack of the season. The Michigan product is up to 33 tackles (25 solo) on the season and will take on the Giants in Week 14. Analysis: Graham got to Dak Prescott by himself on the Cowboys' first play of the game and later joined Chris Long for a second-quarter takedown, but it didn't keep the Dallas quarterback from scoring a touchdown later that same drive. The 30-year-old played 55 snaps -- the most he's seen this season -- while matching his season high in tackles in the process. He's up to 27 tackles (20 solo), three sacks and a pass defensed in 2018. Analysis: Graham's assisted sack gives him just 1.5 on the season. He's not had a prolific year, but he's been able to get to the quarterback twice in the last three games, which could be a sign he's starting to return to form. However, he's still on pace for his worst sack numbers since 2013, and he hasn't done much to warrant consideration as an IDP. Looking ahead, Graham and the Eagles take on the Jaguars in Week 8. Analysis: After posting a career-high 9.5 sacks in 2017, Graham's sack of Kirk Cousins in the first quarter of Sunday's game was his first of the season. The 30-year-old veteran will look to add to that Thursday against the Giants and their suspect offensive line. Graham (ankle) was not listed on the team's most recent injury report, Adam Caplan of SiriusXM Radio reports. Analysis: It had been previously reported that Graham was closing in on a return to full health. Graham's absence from the injury report means he should be available for Thursday's season opener against Atlanta. Graham (ankle) is practicing at about 80 percent, Zach Berman of The Philadelphia Inquirer reports. Analysis: The Eagles have remained cautious with Graham's transition back onto the field. With the big picture in mind, Graham's long-term availability takes precedent over short-term practice reps. As Week 1 approaches, it's still unclear whether Graham will be in uniform. Fortunately, we should have an idea of his status following this week's practice. Graham (ankle) will only take reps in individual drills initially, Zack Rosenblatt of NJ.com reports. Graham (ankle) has been removed from the PUP list ahead of Monday's practice, Dave Zangaro of NBC Sports Philadelphia reports. Head coach Doug Pederson said Tuesday that he didn't know if Graham (ankle) was going to be ready for Week 1, Eliot Shorr-Parks of NJ.com reports. Analysis: Graham, who is recovering from ankle surgery, has been on the PUP list since the start of training camp, and there has been no sign that the defensive end is going to be ready for the start of the regular season. He is coming off a season where he posted a career-high 9.5 sacks, so there isn't a reason for the team to rush Graham back to the field, but there does seem to be a real chance his absence could extend beyond the Eagles' season opener. Graham (ankle) was placed on the Physically Unable to Perform list Thursday, Dave Spadaro of the Eagles' official site reports. Analysis: Graham toughed out his high-ankle sprain through Philly's Super Bowl win, and he underwent surgery after the season. Training camp isn't necessary for Graham's development, as he posted a career-high 9.5 sacks last season and added one in the postseason -- a strip-sack of Tom Brady that basically clinched a championship for the Eagles. Graham is confident he'll be ready to go Week 1 to kick off the final year of his contract. Graham -- who underwent ankle surgery in early May -- hopes to retake the field in time for Week 1 against the Falcons, Jeff McLane of The Philadelphia Inquirer reports. Analysis: Graham indicated Thursday that he will be off crutches next week and believes he is ahead of schedule in his recovery from the procedure. A better grasp on his timeline will likely surface as the preseason progresses, but his status for the beginning of the regular season appears hazy at this point. Graham had ankle surgery earlier in May and is expected to sit out offseason workouts, Chris Wesseling of NFL.com reports. Analysis: Graham suffered a high-ankle sprain in Week 16, but he managed push through it on the way to a Super Bowl win, during which he stripped Tom Brady late in the fourth quarter. This surgery was to expedite the recovery process, and he's on track to be back in action for training camp in July. Graham had his best year yet in 2017, mustering 47 tackles (33 solo) and 9.5 sacks in 15 games. Graham tallied two solo tackles, a sack and a forced fumble in the Super Bowl victory over the Patriots. Analysis: His strip-sack of Tom Brady in the waning minutes of the fourth quarter led to a field goal that put the Eagles up by eight with 65 seconds remaining. It was a perfect ending to a career season which saw the 29-year-old make 47 tackles (33 solo), and shatter his previous career high with 9.5 sacks. He also forced two fumbles, defensed two passes and scored his first career touchdown. The Michigan product should be a top option again at his position in 2018 IDP leagues. Graham (ankle) practiced fully Tuesday. Graham (ankle) was ruled out for Sunday's game against the Cowboys, Zach Berman of The Philadelphia Inquirer reports. Analysis: Graham did not participate at practice this week so this is hardly surprising. The Eagles are likely to feature a heavy rotation at defensive as they have already secured home-field advantage through the playoffs, and the 29-year-old will prepare for a potential return for the divisional round. Graham (ankle) didn't participate in the Eagles' walkthrough Thursday. 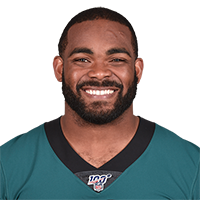 Graham, who departed Monday's 19-10 win over the Raiders with an ankle injury, said after the game that X-rays came back negative, Reuben Frank of NBC Sports Philadelphia reports. He accrued four tackles before exiting the contest. Analysis: Graham indicated that he would be fine going forward, but with Monday's win guaranteeing the Eagles home-field advantage for the postseason, the team might not have much incentive to run the defensive end out there for a mostly meaningless Week 17 matchup with the Cowboys. If Graham is sidelined for the regular-season finale, Chris Long, Vinny Curry and Derek Barnett could pick up a few extra snaps as part of the Eagles' defensive-end rotation. Graham injured his foot and is listed as questionable to return to Monday's game against the Raiders. Analysis: Neither the nature or severity of Graham's injury is clear. Both Derek Barnett and Chris Long should pick up additional snaps in his absence. Graham recorded five tackles (four solo) and 1.5 sacks in Sunday's loss to the Seahawks. Analysis: Graham's career season continued despite facing the elusive Russell Wilson and a Seattle offense that had been tough against defensive ends. The 29-year-old extended his single-season best sack total to 8.5 and maintained production in the tackle department as well, notching his fourth straight game of at least four tackles. He is a reliable starting lineman as most IDP leagues enter their playoffs. Graham had five tackles (all solo) to go with a sack and a forced fumble in Sunday's 31-3 win over the Bears. Analysis: The 29-year-old set a new career mark with his seventh sack of the season, and he now has three in his last four games. He also has at least four tackles in each of his last three contests. Despite the recent production, Graham is not a good bet to set a new personal best in Week 13 against a Seahawks squad that's among the stingiest against defensive ends in IDP leagues. Graham picked up his sixth sack of the season Sunday against the Cowboys. Analysis: Graham managed six tackles (four solo) to go along with his sack. He was pretty efficient on the day, as he did his damage on just 44 defensive snaps (70.0 percent). 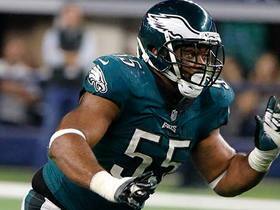 He will look to add to his sack total in the Eagles' upcoming game versus Bears. NFL Network's Mike Garafolo discusses how scoreboard-watching will affect the No. 6 seed in the NFC. 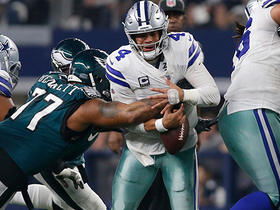 Philadelphia Eagles defensive end Michael Bennett rips the ball from Dallas Cowboys quarterback Dak Prescott to force a fumble. 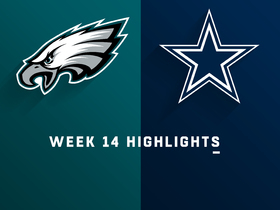 Watch complete game highlights from the Week 14 matchup between the Philadelphia Eagles and Dallas Cowboys. Washington Redskins quarterback Mark Sanchez recovers his own fumble after being sacked by Philadelphia Eagles defensive end Brandon Graham. 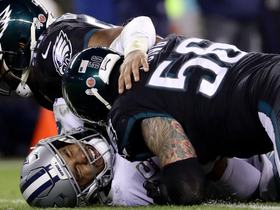 Philadelphia Eagles defensive ends Chris Long and Brandon Graham reach Dallas Cowboys quarterback Dak Prescott for a 13-yard sack. 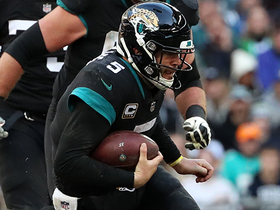 Jacksonville Jaguars quarterback Blake Bortles scrambles, and dives for key first down. 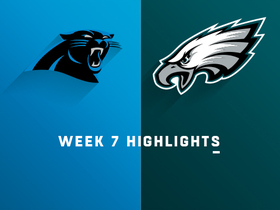 Watch complete highlights from the Week 7 matchup between the Carolina Panthers and the Philadelphia Eagles. 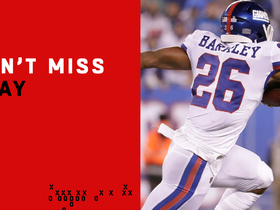 New York Giants running back Saquon Barkley catches a short pass, breaks multiple tackles and gains 55 yards in a Week 6 game against the Philadelphia Eagles on "Thursday Night Football."